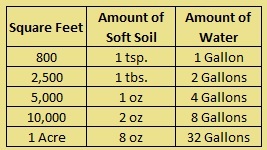 Brief explanation of how to mix water with soft soil for application to soil. The ionic nature of soil and the polarized molecular structure of water result in very strong bonds in the soil that you are attempting to grow plants. Our Soft Soil breaks these bonds loosening the soil. Simply spray Soft Soil over the area you wish to loosen. Soft Soil starts a reaction that can go 4 feet deep over a 4 to 6 week period. Rain/water assists the process. 2 ounces covers a 3 foot radius around 1,000 trees for $20. One ounce will cover 4,500 sq ft. At 3’ x 3’ (9 sq ft) it will do 500 seedlings. The trick is knowing how your sprayer will evenly distribute that ounce mixed with the amount of water you need to cover the 5,000 sq ft. You can either use past experience with other products or run a test. Is Soft Soil Soil treatment toxic? No, Soft Soil is an environmentally friendly, non-toxic, biodegradable formula. It will not harm plant life, pets or animals, children, skin, etc. Can Soft Soil be used with fertilizers and other chemicals? -Yes, Soft Soil is compatible with most chemicals and fertilizers. It may be applied with other fertilizers/chemicals in the same sprayer tank, and with the same spraying equipment. In fact, by loosening up the hard, compacted soil, Soft Soil often improves the incorporation of other fertilizers/chemicals. A jar test is always recommended before mixing. How does Soft Soil work? -Upon application, Soft Soil begins reducing the tension of your soil. Soil and water molecules bond together -- Soft Soil breaks this bonding so water is able to flow through the soil. Thus, the soil is left soft, easy-to-work, and easy-to-dig or till. How long does Soft Soil take to start working? -Soft Soil starts working within minutes after application. However, with time, and additional rainfall or watering, the results will become greater. How can Soft Soil work so fast? -Once Soft Soil comes into contact with soil, the movement of stressed water takes place. Soft Soil does not have to soak in before it starts to work. Is Soft Soil effective on all soil types? -Yes, Soft Soil is effective on all soil types because Soft Soil works on properties that are present in all soils. Soft Soil will help clay soils loosen and drain better. In sandy soils where excessive water movement is a problem, Soft Soil improves the absorbency of the soil, allowing better moister retention. Does Soft Soil stain house siding or decks? -No, if Soft Soil does get on these areas, wash thoroughly with water. How do I know that Soft Soil is working? -Soft Soil begins to work right away, and in most soils, you can see the loosening of the soil within minutes by penetrating the treated area with a spade, and then comparing it to an untreated area. However, with time the results will increase. For example, if you waited 2-3 weeks and then again penetrated the treated area with a spade, you would see a much greater difference. Also, by taking your spade and digging up and turning over the soil, you will notice the soil is moister and will crumble easier in the treated area.